@willgraham, I don't know what kind of wet food the vet gave you, but typically you'll want to boost the diet with soluble fiber and probiotics. Give him a spoonful of canned pumpkin, and some plain kefir or yogurt. I would invest in another dog food instead of going back to Blue Buffalo. Purina shouldn't even be on the "maybe" list. I think that was only a question since that is what he was on as a puppy. He was transitioning him to Blue as that was his intended future food. I think probably the blue would be better in the long run- it seems to be a great food even though it's pretty rich. Hopefully he's not allergic to it. Could it be one of his treats? I'm no expert but that's my vote. Hope some others key in on what food/allergy concerns. Since you are searching for answers to the itching and aren't sure what the cause is, I wanted to bring up the possibility of vaccinations to you. As Sunyata stated, adults are more reactive to food allergies, not puppies. I can confirm that, Kira did not begin losing fur on her legs until she was over a year old. I didn't realize that your dog was still a young puppy. It could be losing its puppy coat due to the weather change and it makes them very itchy. Has anyone seen weight loss with their Shibas before successfully identifying a food allergy? Rockys allergies unfortunately match both symptoms of environmental and food allergies sans diarrhea or gas with the exception that he has lost a significant amount of weight. He was allergy tested for airborne allergens back in May and was on immunotherapy but hasn't gotten any better and the amount of weight he's lost scares me and every vet I've seen just goes on about how I should do the sterioids etc etc and get off of raw food so I'll be switching vets. 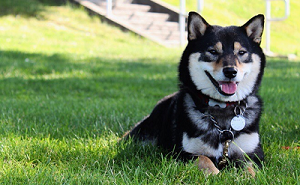 I personally have never noticed weight loss from my Shiba or any previous dogs that have had a food allergy. I had a Labrador Retriever that was allergic to chicken, and my Shiba is allergic to wheat. The Lab would itch like crazy and Kira lost fur on the insides of her legs. But to my knowledge, food allergies don't necessarily cause weight loss - it could be an altogether different issue. I think that considering that your vet is not standing by your decision to feed raw, you should absolutely get a second opinion from another veterinarian that will support you and ask them about the weight loss issue as well. It might not be a bad idea to have a full blood panel done on your dog to see if there are any underlying issues that could be causing it. Better safe than sorry - I recommended to my best friend to get her Chihuahua to have Titer tests done instead of vaccinations. The vet had enough blood left to send out for bloodwork and she ended up finding out that her liver counts were DOUBLE what they should have been! Timing is essential with things like that, we very well could be saving her because they caught it before she developed any symptoms! @mmobed, are you still feeding Darwin's? That is perfectly good food. The only trouble with raw is if you do it yourself and don't feed a balanced diet. Definitely find a vet who is not going to fight you over your educated choices. If immunotherapy isn't working fast enough, consider Atopica or Apoquel. Short answer, yes I have seen dogs lose a good bit of weight due to allergies, inhalation not necessarily ingestion oriented, and vise versa. In addition, I also have seen dogs lose weight due to IBD. Sometimes the two types of allergies (food and inhalation) correlate or overlap with some of the same exhibited symptoms. In other cases, symptoms indicate a separate issue entirely. Sometimes steroids are helpful in relieving the itch short term for allergies. However, there are other medications on the market if your vet can get them prescribed for your case. FYI, currently there are some shortages of the newer products by the manufacturers, therefore, only a dermatology vet will be able to get the non steroid prescripts your dog may need. Find a vet that will work with you if you do not find current treatment to your satisfaction. Probably seeing a dermatology vet if you have not already done so is the best idea. @Kira_Kira After the symptoms were ongoing for several months I had a full blood panel done and everything came back clear so it's been an uphill battle figuring out exactly what is going on. @Zandrame Yes he's still being fed Darwins with the exception of switching over to Stella & Chewys for 2 months to use rabbit as a novel protein but back on Darwins when there was no luck. He was originally in the 25lb range but over the past year he's at about 18lbs now and looks terribly skinny for his build. I did try Atopica after his dermatologist prescribed it but his body would constantly reject it and I'd find it somewhere on the carpet several minutes later. @StaticNfuzz I did give the steroids a go in the beginning which seemed to help just a tiny bit but eventually they stopped working as well and I began to feel uncomfortable continuing using them. I've been looking into Dysbiosis aka leaky gut and many of his symptoms match that of dysbiosis but I'll leave that up to his vet to determine and as all of you mentioned I will definitely be looking for a vet that is more approving of his diet. @mmobed, what symptoms does he actually have besides weight loss? You said he doesn't have gas or diarrhea, and his bloodwork is good. Is he eating well? The number one cause of weight loss is inadequate caloric intake. What happens if you feed him more? We went through this with Kouda in May when he was doing a lot of sports - he went from about 25 to 20 lbs over a few months but it was so gradual we couldn't really tell. When he blew his coat it was more obvious. We discussed with his vet, increased his food, and he's now back to 24 lbs. Are you still doing the immunotherapy? It's not a quick fix. Kouda's been on it since March and still has flare-ups, but the constant itching is lessening and rebounds are faster. How long did you try Atopica? Vomiting is the most common side effect, but often resolves with continued treatment. It can take 4-6 weeks to see results. You really need to find a vet you can work with. You shouldn't self-diagnose too much, and you need to give the prescribed treatments a chance to work. @Zandrame Aside from the fact that he is experiencing a severe degree of weight loss, he is constantly scratching and licking his entire body to the point of rawness, causing yeast breakouts. I have to review the blood work to see if it includes thyroid or not - but I was under the impression that it did (although I could be wrong about this). I have been using coconut oil in his raw diet to control the yeast and although he has experienced less yeast he still has a yeasty smell and the weight loss continues. The immunotherapy has been going on for exactly 7 months but he's had breakouts worse during the immunotherapy then he has had before he started it. His dermatologist mentioned vomiting was a common side effect but every alternative we tried to keep the atopica down with had failed for almost 3 weeks. I do understand I shouldn't self diagnose I'm just at a point of desperation as it pains me to see him suffering this much. @mmobed, as I'm not a vet I don't have answers for you, but I do feel your pain and know your frustrations. It's probably a difficult time to find a vet during the holidays, but keep at it. From what you've said, I honestly don't think the weight loss is related to allergies, unless it is from lack of appetite due to stress or pain from his wounds. So, will he eat more if you offer it? That would be my first approach to get weight on him. Do you cone him when he itches? We have a strict policy with Kouda because of the damage he can do. With a couple intense nibbles, his toes are bloody. If he can't stop chewing himself when asked or with distractions, the cone goes on. Especially at night when we can't monitor him. Do you use any topical products on his skin? If you shampoo him regularly, avoid products with oatmeal, which feeds the yeast. Kouda's allergies manifest primarily as itchy feet, so we clean his paws after every outing, and when they are really bad we dunk each foot in a cup of water + baking soda or vetericyn. Genesis (steroid) spray, to lessen the itch. This worked better for Kouda than predisone, and our vet said we could use it indefinitely, but we weren't comfortable relying on steroids long-term. We never tried the iodine wash, but were curious. Thanks @Zandrame definitely keeping at it hopefully will come up with something soon. His appetite has been the same and in fact I feed him more now hoping that it would help him put on weight but that hasn't been the case. I was thinking about coning him but he doesn't scratch when I'm around and if he does will stop if I say something so he waits until I leave. I have a anti fungal and antibacterial shampoo his derm had given me which temporary helps and I had Gensis spray but he has a reaction to it whenever I spray him so I've stopped using it. I began feeding him coconut oil which appears to have helped with his yeast outbreaks and I stopped the salmon oil he had been on just to rule out any possible fish allergies. I'm going to look into your product suggestions and see what I can manage to get for him until I find him a vet this week. Thank you so much for your responses, I really appreciate it!